It's not actually that cold outside, at least not here. We have yet to have a hard frost in my part of Northern Virginia. But we inevitably will. It'll get cold and miserable outside, and unlike back in 2009 when I did a similar post, I don't have the luxury of skipping cold, wet, snowy, or otherwise miserable days (because I commute by bike, you see). Fortunately, I also have a lot more disposable income than I had in 2009. So I've been accumulating gear year-by-year, and I have more insight to offer regarding what to wear. The last post I did on this topic was all about making do with cheap gear. Part of this was based on my relative poverty, but part was based on a misunderstanding of what makes clothing expensive. The technology and development that have gone into a $250 pair of cycling shorts is worth more than what's gone into a $20 pair. You will feel that difference on a six-hour ride (and I've had the saddle sores to prove it). The take-away is that you should buy the best gear you can afford, rather than looking for the cheapest gear you can find. It probably won't matter for a 55-minute spin class, or a quick ride in 55* temps. But the more extreme your riding conditions, the more you will suffer if you buy cheap gear. Since we're talking about extremes in this post--extreme cold, extreme wind, extreme snow/sleet/rain/ice/brimstone--you want quality gear. It's okay to look for items on sale, but make sure it's quality stuff on markdown, not cheap stuff with sub-par materials and construction. On a related note, this goes for buying stuff from your local bike shop rather than from a discount site; at your LBS, you get the expertise of fellow cyclists, and they can help you separate the quality kit from the second-rate. Weather can change. Your intensity may vary. You might get lost. It's important to be prepared for multiple scenarios when you go out for a ride or a run. Unless you're running or riding with a backpack, the easiest way to take what you need with you is to wear it. Layering will also help with moisture transfer and heat management. If you know how to layer for other outdoor activities, the same principles will work for cycling. Bottom layer (closest to your skin) should wick moisture away from your body. Middle layer should insulate you by keeping warm air close to your body. Top layer should protect you by keeping wind and/or water away from your body. 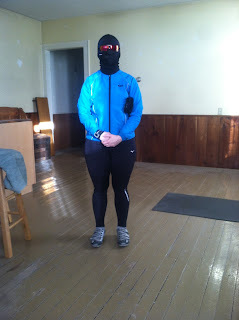 For my base layer, I usually wear an undervest and arm warmers, but if the temperature goes below 30*F I'll switch to a long-sleeved base layer. For temps 30*-50*, I use a short-sleeve jersey as a mid-layer. Below 30*, I switch to a long-sleeve jersey. For my top layer, I wear a wind- and water-resistant jacket if the temps are above 30* and a thermal cycling jacket if temps are below 30*. REI has some really good advice about layering, too. As a female, I'm fortunate to have genitalia that are kept warm and snug inside my body. For my male readers, I highly recommend you read Steve in a Speedo's advice on keeping your man-parts from getting frost-bitten. I can offer recommendations on some of the other body parts that I consider bits, though: fingers, toes, ears, and nose. Do not skimp on items to protect these parts of your body! They won't freeze or fall off, but they will make the difference between enjoying your cold-weather ride and hating your life and wanting to die. Get nice gloves with wind-proof tops and fronts. If you have the option, buy your winter gloves a little on the big side, to leave room for a thin glove liner in case it gets really cold. Buy a pair of wind- and water-proof shoe covers. Get warm, wind-proof headgear to cover your ears. If you tend to overheat easily, opt for a headband that covers your ears rather than a full skullcap. If it's really cold, cover your nose with a buff, a balaclava, or a ski mask (try to find one with ventilation holes so you can still breathe). If it's not super cold, I recommend putting Vaseline on the tip of your nose and in the nostrils to prevent windburn. This is particularly important if you're commuting. Because if you don't have the right gear for a training ride, you can just throw your bike on the trainer and spin & smile with one of my workouts. But if you have no option but to ride your bike to work day in and day out, you really need to have options for your gear. Have a pair of light-weight, mid-weight, and heavy-weight gloves; have thermal tights and cool-weather tights; have pull-on booties and a pair of full overshoes; have options for jackets based on how cold, wet, and windy it is. Write it all off as commuting costs for business purposes. Don't mention to the IRS that this gear moonlights for personal use. After all, you are kind of saving the world by commuting on your bike instead of in a car. If you need to pick up some new gear and don't have a local bike shop (FIND ONE!) or you've tried them but found the customer service lacking, you can e-mail me and I will gladly give you some recommendations. Or come and ask me over on Facebook.